I’ve been detoxing, eating mostly fruits and occasional green salads at night. 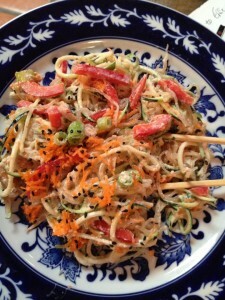 I am dreaming of this raw pad Thai with mock peanut sauce I made awhile back. Doesn’t it look amazing? It’s all raw even the kelp noodles. It also has zucchini, red peppers, green onions, carrots and black sesame seeds.The peanut sauce is made from almond butter that I made in the Vitamix. The trick is to freeze the almonds after soaking them so they don’t get overheated. Blend all ingredients in blender until smooth. I got this recipe from Living Cuisine Academy. Try it. You will love it! This makes two cups. To make the noodles I used a Paderno World Cuisine Plastic Spiral Vegetable Slicer. 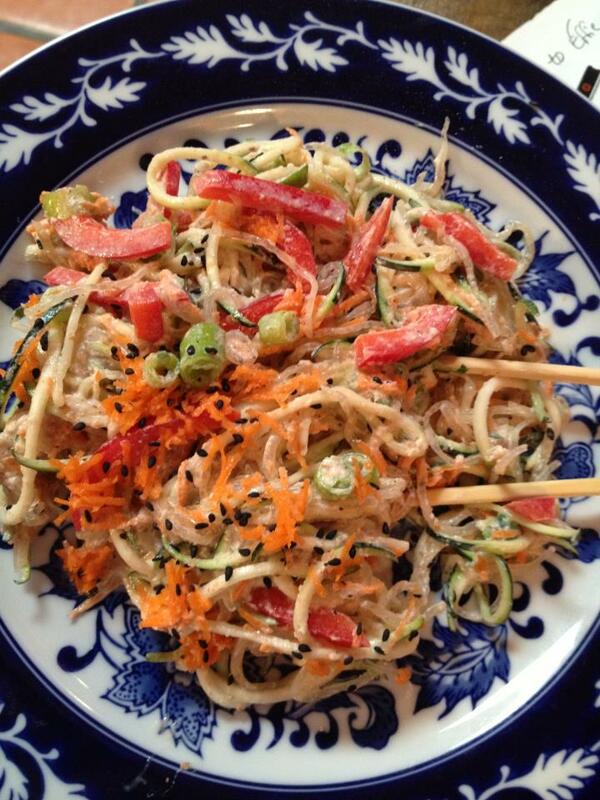 I used one whole medium sized organic zucchini mixed in with a small handful of raw kelp noodles.You can find the kelp noodles at most health food stores or online. If you don’t have the spiralizer, you can cut your zucchini in very thin strips using a vegetable peeler lengthwise and then cut them again so they are thinner. Use one medium to large zucchini for each serving.